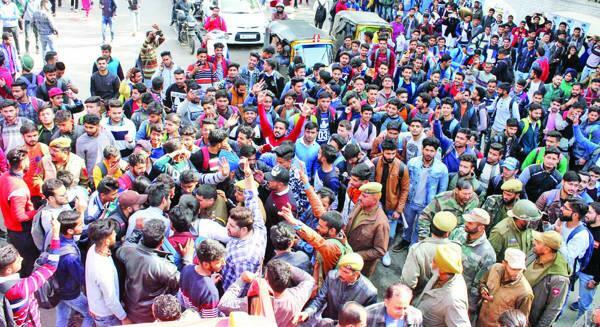 Srinagar: A day after stranded Kashmiri passengers were thrashed in winter capital of Jammu and Kashmir, Jammu city, students of Government Gandhi Memorial (GGM) Science College, rallied outside the college campus sloganeering, “desh ke gaddaro ko, goli maro salo ko,” (Shoot the betrayers of the country) accompanied with “Vande Matram” (Long live homeland). Talking to the media, the stranded Kashmiri passengers said that they are stuck, and want to go home as soon as possible, but blamed the unwillingness of governor-led administration. A protester in the video said, “issue is our brothers are being beaten up in Jammu Science college, and we want justice.” One of the M.A.M. Government college’s student said on the video that the protest is against the Lathi charge by the Jammu police inside the campus yesterday. Another one said we provide Yatris etc with food and help them when they are in Kashmir, while on the other hand we are being beaten, ” What sort of humanity is this?” he asked. The stranded Kashmiri passengers also urged the government to help them. They also blamed the police of showing cold shoulder to Kashmiris, ” In Kashmir they (police) shower us with pellets. Here they were hearing all kinds of communal hatred being spewed upon us,” a stranded Kashmiri said.